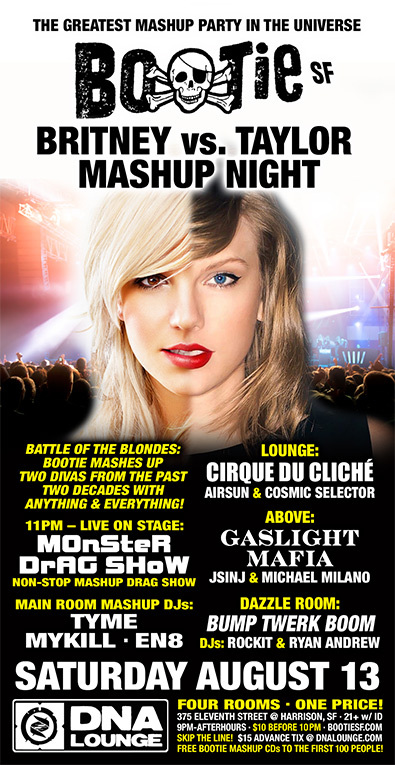 Bootie pays mashup tribute to two pop princesses in an epic battle of the blondes -- it’s Britney vs. Taylor Mashup Night! Two of your favorite divas from the past two decades, mashed up with anyone and everyone -- no era or genre is safe! Four rooms, one price! Bootie pays tribute to two of today’s modern divas, by having them battle it out at the club for mashup pop supremacy – it’s Britney vs. Taylor! Resident DJs Tyme, Mykill and EN8 spin the best songs Britney Spears and Taylor Swift have ever created — from big hits to deep cuts — and giving them the Bootie treatment by mashing them up with anybody and everybody! Plusm the Monster Drag Show takes the stage at 11 PM for a non-stop divalicious drag tribute to Britney and Taylor! Upstairs, Cirque du Cliché takes over the Lounge, as DJs Airsun and Cosmic Selector spin music guaranteed to keep you bumping on the dance floor, while in Above, it’s Gaslight Mafia, as DJ JsinJ and Michael Milano bring electro-swing and more to tempt swing dancers and club dancers alike! Finally, Bump Twerk Boom takes over the Dazzle Room, with DJs Rockit and Ryan Andrew making you bump, sweat, and grind with bootie-twerking bass! All this, plus drag hosts Suppositori Spelling, Abominatrix, and Bea Dazzler, free Bootie mashup CDs to the first 100 people, and club photography by ShutterSlut!